ATLANTIC BEACH — The holidays may be over but that evergreen tree that symbolized the season can now be put to a new use, improving the health of the dune system on a nearby beach. Natural Christmas trees with all decorations and lighting removed are being collected now through Jan. 22 in both parking lots at Fort Macon State Park, 2303 East Fort Macon Road. The state park began collecting trees this season on Dec. 26. Several beach towns along the North Carolina coast also collect trees for use in rebuilding dunes, but not all coastal communities or state parks accept trees, so if your community isn’t listed below, be sure to check before hauling off the tannenbaum. 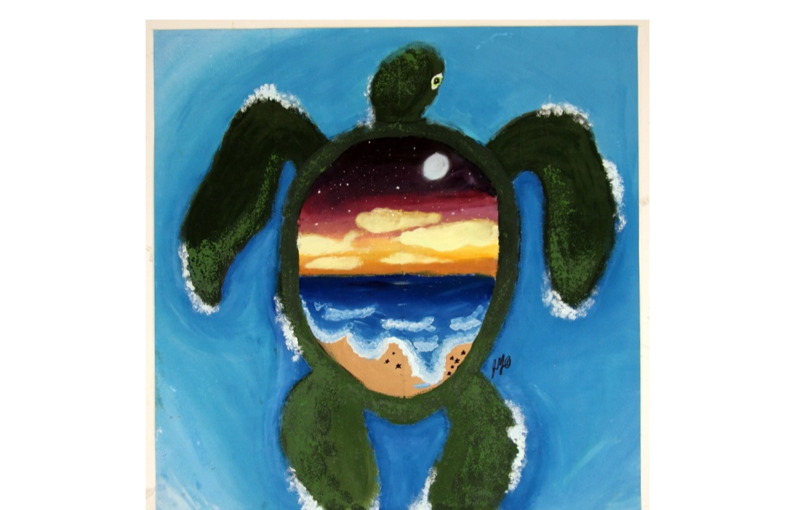 Fort Macon’s repurposing program has continued for more than 50 years. Park Ranger Paul Branch explained that Fort Macon has been collecting natural Christmas trees since the winter of 1964. 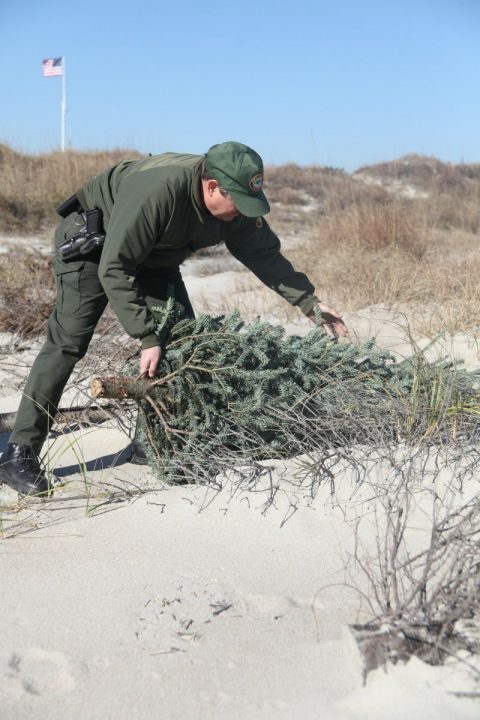 Fort Macon Superintendent Randy Newman added that Christmas trees have been used to repair damage to sand dunes caused by foot traffic and strong winds and to prevent the natural material from going into landfills. The trees collected at the park are placed in areas where vegetation no longer exists to hold the sand in place. Then the trees are taken out on the beach and placed where needed. Trees placed in areas where the wind or tide over-wash could displace them are secured in place with twine and stakes. 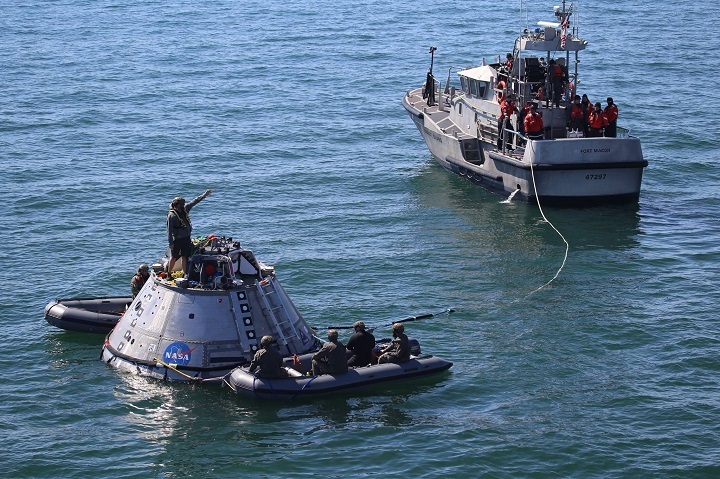 “We are sometimes fortunate to have Boy Scout groups or other volunteer groups to help drag them into place,” Branch said. To volunteer or find out more about Fort Macon’s program, call 252-726-3775. While other parks, such as Fort Fisher State Park in Kure Beach, Jockey’s Ridge State Park in Nags Head and Hammocks Beach State Park in Swansboro, have collected trees for natural resource projects in the past, officials at these parks said in response to emails that they are not collecting trees this year. 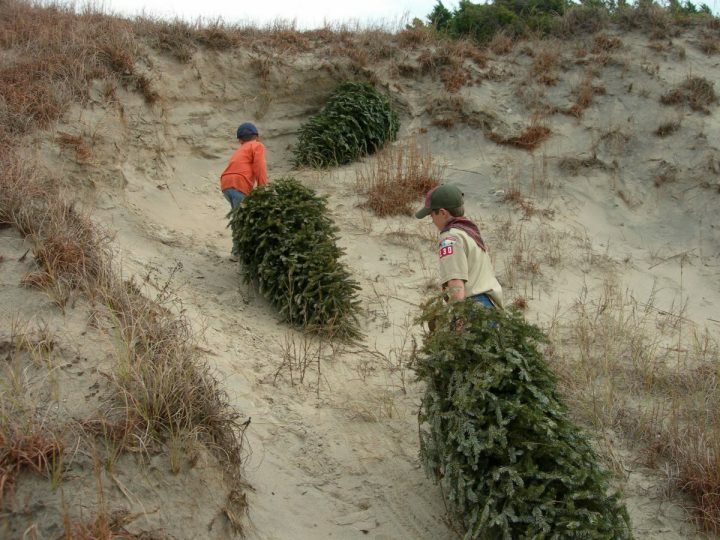 Some coastal towns, including Pine Knoll Shores and Emerald Isle, have also begun collecting natural Christmas trees for use in dune rebuilding. In Pine Knoll Shores, trees may be left at any time in the parking lot at the Iron Steamer Beach Access. The town’s public works staff will relocate the trees to the dunes. Pine Knoll Shores Town Manager Brian Kramer explained that years ago a few residents participated in Fort Macon’s Christmas tree recycling program. For questions about the tree recycling program in Pine Knoll Shores, call 252-247-4353. 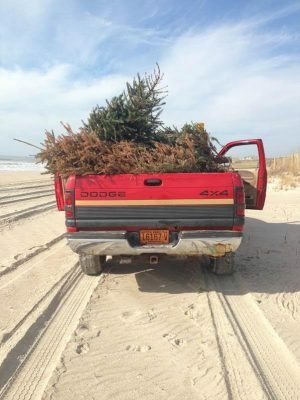 Frank Rush, town manager in Emerald Isle, said natural Christmas trees are being collected as part of that town’s weekly yard debris collection service. 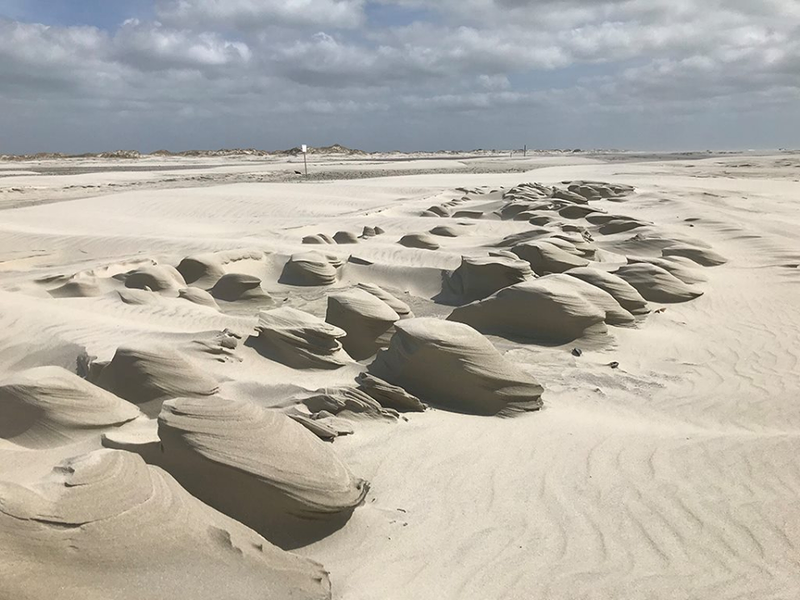 Also, residents with oceanfront property are encouraged to place their natural Christmas trees in the dunes to promote sand accretion. They are welcome to collect old trees from the curbside in their neighborhood for placement in the dunes as well. However, they are asked not to block pedestrian or vehicular access on the beach strand. 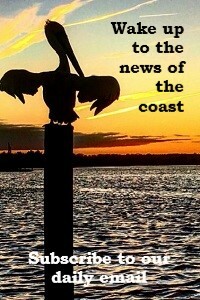 To learn more about Emerald Isle’s efforts, call 252-354-3424. Kitty Hawk has tree-recycling program for residents who need trees for their properties. W.S. Midgett, Kitty Hawk’s public works director, said town staff collects the trees and places them in the corner of the public works department’s parking lot, where property owners can get them as needed. “Residents then pick them up and place them on the beach at their properties to assist in catching sand. This is on a first come, first served, self-service basis,” he said. A handful of municipalities and counties along the coast use the trees in different ways, rather than placing them in the dunes. Carolina Beach Town Manager Michael Cramer explained that town staff collects all trees placed at the curb every Monday, Wednesday, and Friday from Jan. 9 and January 30 and takes them to the County Landfill to be mulched. This is a free service to residents. “We also work with the Surfrider organization to provide them with trees that are used to help improve our dune ecosystem,” he added. 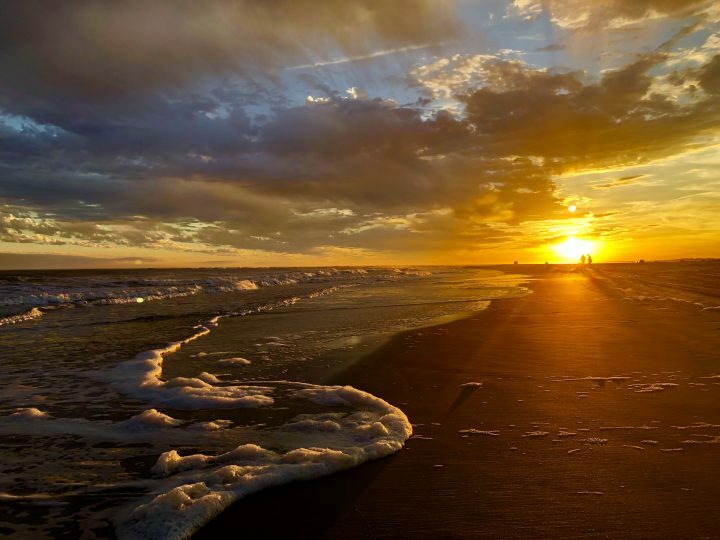 This year, the Cape Fear Chapter of the Surfrider Foundation’s fourth annual project will take place around the Periwinkle Lane beach access. Volunteers will place the trees at the toe of the dunes to collect windblown sand and build the dune system. Dare County Public Works Director Edward Mann said Christmas trees collected by the county are put to a different use. “We recycle our trees along with the other vegetative debris by grinding it into mulch and giving it away to our citizens,” Mann said. In Duck, trees will be collected again on Jan. 9 as part of the town’s residential trash collection. In Kill Devil Hills, curbside collection of natural Christmas trees will begin Jan. 11. Trees should be placed curbside no later than Jan. 10. Nags Head’s curbside collection of Christmas trees is by appointment only. Call 252-441-1122 to schedule pickup. 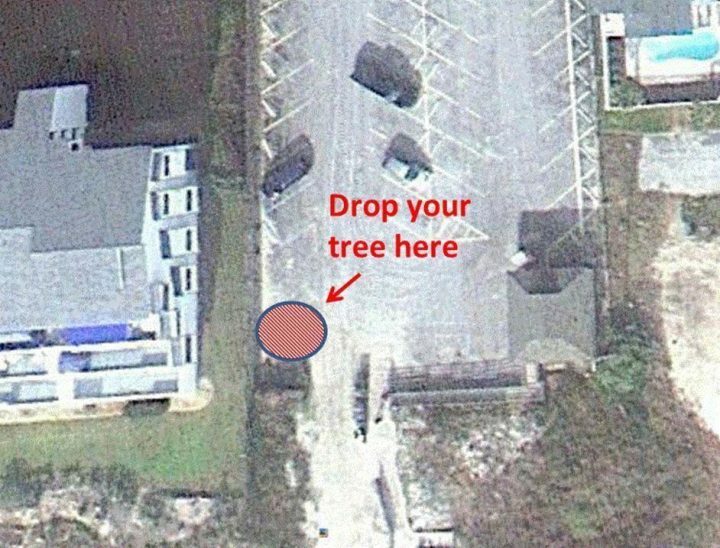 For residents of Southern Shores, Kitty Hawk and Manteo, towns will pick up trees curbside, “in a timely fashion,” according to information on the county website. Residents of unincorporated areas of Dare County are encouraged to bring their trees to either the Buxton or Manteo recycling collection centers, where the trees will be recycled into mulch. Onslow County, as with many other counties across the state, accepts trees at its convenience center sites. 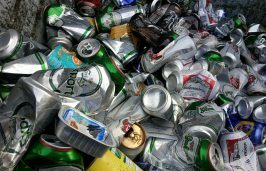 Lisa Rider, assistant solid waste director for Onslow County, said the county has a long tradition of recycling Christmas trees. 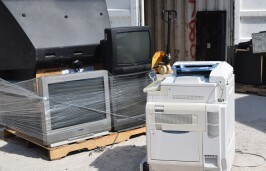 Onslow County Solid Waste accepts trees at its landfill drop site at 415 Meadowview Road, Jacksonville, from 6:30 a.m. to 5 p.m. Monday through Friday at $25 a ton; and at Folkstone and Midway Park convenience center sites, 8 a.m. -5:30 p.m. Monday, Wednesday, Friday and Saturday at $1 per tree, Rider said. Other coastal towns may also collect natural Christmas trees for dune preservation or to deliver collected trees to a nearby oceanfront town. For example, Beaufort’s public works department will collect natural Christmas trees on Jan. 11-13 to deliver to Fort Macon State Park. Contact your town or county to see what programs they offer.